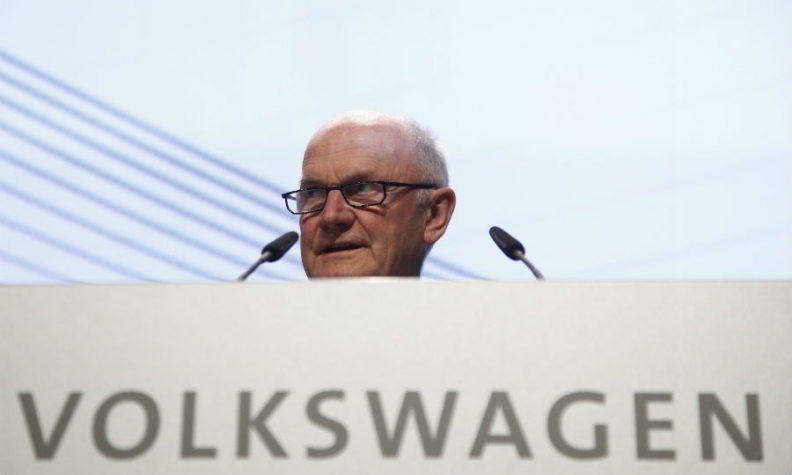 VW Chairman Ferdinand Piech has talked with Fiat's Agnelli family, a report said. FRANKFURT -- Volkswagen, Fiat and Fiat's controlling shareholder all denied a German magazine report that the companies have discussed a possible merger. VW has held talks with owners of Fiat Chrysler Automobiles about a possible merger, the German magazine Manager Magazin reported today, citing unnamed company sources. Fiat's owners want to shift their focus to the Ferrari brand and quit the volume automotive business, the publication said in a report, without being more specific. The Chrysler division could help VW in the United States, where the automaker has struggled to keep its sales momentum, the report said. However, a VW spokesman said it currently had no takeovers on the agenda as it was focusing on improving efficiency at the group. The Agnelli family's holding firm Exor, which owns a 30-percent stake in Fiat Chrysler, denied any talks had taken place, as did Fiat. A Fiat source told Automotive News Europe that the company is not aware of any meeting between its shareholders and management with VW Group representatives. Manager Magazin said VW Chairman Ferdinand Piech, who is a member of the Porsche family that controls VW, has held various talks with associates and members of the Agnelli family. There are a number of obstacles to any deal, including finances and divergent strategies pursued by both Fiat and Volkswagen, the magazine said. Gabriele Gambarova, an analyst with Banca Akros in Milan, said: "We deem the news realistic." Juergen Pieper, an analyst with Bankhaus Metzler in Frankfurt, said: "Volkswagen has an urge to become the No. 1 global automaker, and an acquisition of that size would bring them to their target immediately." But real interest in Fiat as a whole is "rather unrealistic" and would entail many problems, including Fiat's struggles in Europe and potential antitrust issues in South America, Pieper said. The report sent Fiat shares up as much as 5.1 percent to 7.99 euros, the stock's biggest intraday gain since Jan. 2. VW shares fell as much as 2.4 percent to 184.65 euros. VW is valued at 88 billion euros ($120 billion), while Fiat is worth 9.9 billion euros. VW has almost 18 billion euros ($24 billion) in cash but CEO Martin Winterkorn said in March that the company had no plans to expand the group through acquisitions as it was focusing on integrating its 12-brand network. VW has since sealed a 6.7-billion euro buyout of minority shareholders at Swedish truck division Scania to forge a long-planned alliance of its truck brands. The Manager Magazin report could suggest "diverging views" between VW's management and the supervisory board about the carmaker's future course, said Arndt Ellinghorst, a London-based analyst at investment researchers ISI Group, at a time when Winterkorn, 67, and Piech, 77, are soon likely to face a debate over succession. Rather than talking about further expansion, top managers at VW - concerned that profitability gains aren't keeping pace with the company's steadily-growing size - have been pushing a new efficiency program that includes 5 billion euros of cost cuts per year at the core passenger-car brand. Earlier this month, VW also denied a report it was planning a bid for U.S. truck maker Paccar next year. "The risks from integrating Italian plants and managing a U.S. business are material and we do not believe that the potential benefits justify the risks," Ellinghorst wrote in a note to clients. A person familiar with the situation told Reuters that VW would more likely bid for Fiat assets such as the supplier Magnetti or Alfa Romeo rather than the entire company. A member of VW's supervisory board, which oversees the management board, said the 20-member panel had at no point of time had any discussions about a purchase of Fiat. Still, Piech and Winterkorn have repeatedly expressed interest in Alfa Romeo despite rebuttals from Fiat CEO Sergio Marchionne, which Marchionne has vowed to keep. Manager Magazin said VW was hoping to use Chrysler's U.S. distribution network to help solve its own problems in the world's No. 2 auto market where flagging sales of the VW brand in January sparked the ouster of VW's regional chief. However, VW's U.S. troubles "are more image and pricing problems and not so much problems of distribution and manufacturing," an auto analyst said. "Buying Chrysler would not really help VW." While rumors of a potential Agnelli family exit have surfaced over the years in Italian press, Exor has repeatedly said the stake remained a strategic investment for the family. Manager Magazin also said VW and Fiat Chrysler's owners were far from reaching an agreement about a possible price. The Wall Street Journal, citing two people familiar with the situation, also reported there are no talks taking place. One source told the Journal that the Agnelli family chose to incorporate Fiat Chrysler Automobiles -- the company to be formed by the formal merger of Fiat and Chrysler later this year -- in the Netherlands to exploit Dutch law that covers a company's non-voting shares. Those rules will make it easier for the Agnelli family to continue to control FCA, the paper said.